After two years of failed garlic harvests, last year I spent $45 on a sampler pack of four types of garlic from Southern Exposure Seed Exchange. I'd read that garlic needs to acclimate to local conditions, and they were the closest company I could find with garlic for sale. I also figured that by trying four varieties, we could find one well suited to our farm and our palates. I planted about two thirds of the two pound sampler (giving away the other third), and was stunned by our harvest in June. Both the Silverwhite Silverskin and the Inchelium Red grew like gangbusters, while the Music and Italian Softneck made a pretty good showing. I figured the garlic we harvested would last us all year with some to give away. But then two things happened. First, we went out of town immediately after the harvest and didn't cure the bulbs properly, so about a quarter of them went wormy and rotted. And our tastes seem to have changed. 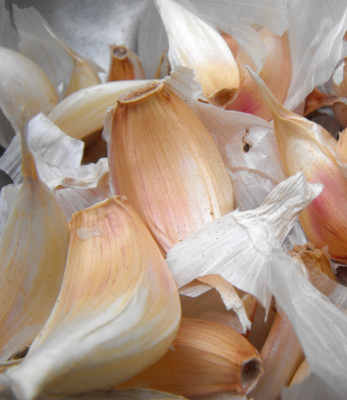 Not many years ago, I wouldn't even eat garlic, but lately the bulbs have been taking a more and more prominent place in our diet. Suddenly, our June harvest looked...small. So this year we're planting twice as many beds as we did last year --- 18 instead of nine. (Each bed is approximately 18 square feet.) I put the first half in the ground on Friday and plan to plant the rest early next week. 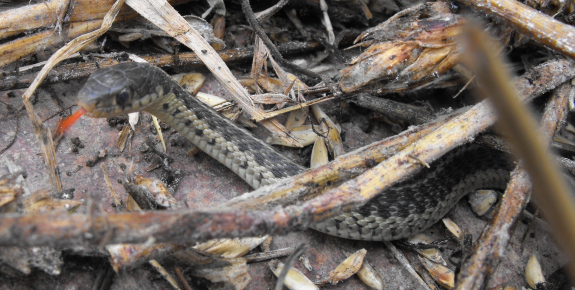 It's always a good sign when I stumble across two snakes in the course of a planting day --- the garter snake below was hiding in the moldy straw I used as mulch while a worm snake (and a toad) slipped out of the soil as I dug in manure. Here's hoping that the snakes are telling me that next year we'll have garlic to give away!